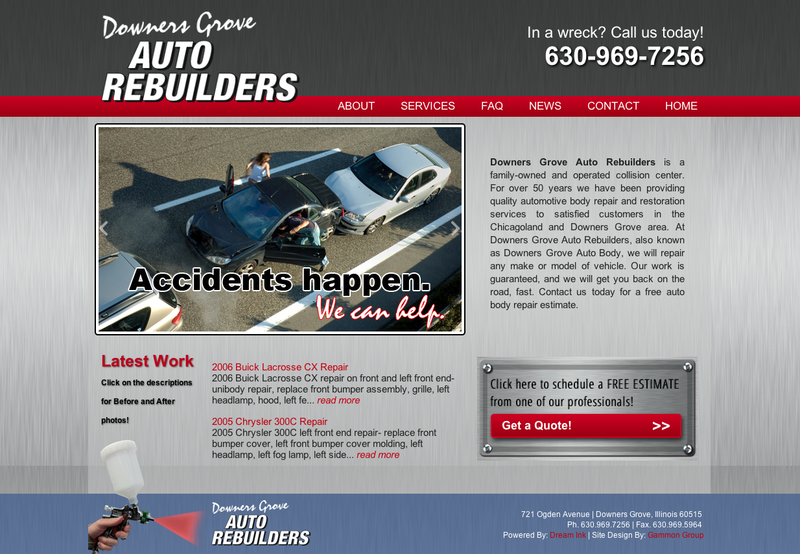 This is an auto body website design for Downers Grove Auto Rebuilders. We chose the WordPress format for this website design and SEO for easy content management for adding new projects, slideshow images, and content on a regular basis with ease. Since consumers are searching the web more often when looking for collision repair providers, this was an important factor in their decision to overhaul both the design and functionality of their website. – High-impact slideshow on the home page. – One-click for quotes with the “Get a Quote!” button on the home page, converting new visitors to new customers. – Latest Work feed on the home page for rotating fresh keyword optimized content and Before & After photos of vehicles. – FAQ section for commonly asked questions about collision repair. We are currently working with D.G. Auto to expand their online presence with regular updates, effective auto body website design and SEO services. Contact us today for more information on ways we can help increase your visibility and effectiveness in search engines!